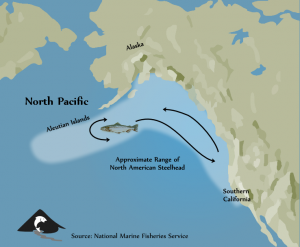 Where Do You Find Steelhead in the Pacific Ocean? Young win­ter steel­head fry, freshly hatched in the cold waters of the the North San­tiam River, face a long and har­row­ing jour­ney that takes them to the sea and back. In spring through early sum­mer of their sec­ond year, steel­head smolts from the North San­tiam River enter the sea and move directly off­shore. Beyond that, very lit­tle is known about the specifics of marine habi­tat use and dis­tri­b­u­tion of Ore­gon steelhead. But in gen­eral North Amer­i­can steel­head (from Canada, the North­west, and Cal­i­for­nia) have moved well off­shore and are con­cen­trated in the west­ern Gulf of Alaska by late sum­mer. In the 1970’s and 1980’s researchers learned that North Amer­i­can steel­head pre­fer a par­tic­u­larly nar­row range of water tem­per­a­tures. Steel­head in the north­ern Pacific are found in waters between 37° and 61°, and nearly 96% were found in waters colder than 54°. As water tem­per­a­tures rise, oceanic steel­head press north­ward and west­ward to stay within their pre­ferred tem­per­a­ture range.